On the 8th (Tue), get a taste of the local shopping with Union Square and then take a leisurely stroll along Fisherman's Wharf. To find traveler tips, more things to do, maps, and other tourist information, read San Francisco journey builder website . Atlanta to San Francisco is an approximately 6.5-hour flight. You can also do a combination of flight and subway; or drive. You'll gain 3 hours traveling from Atlanta to San Francisco due to the time zone difference. Traveling from Atlanta in January, things will get a bit warmer in San Francisco: highs are around 59°F and lows about 46°F. Finish your sightseeing early on the 8th (Tue) so you can travel to Grand Canyon National Park. Start off your visit on the 9th (Wed): explore the striking landscape of Grand Canyon National Park. 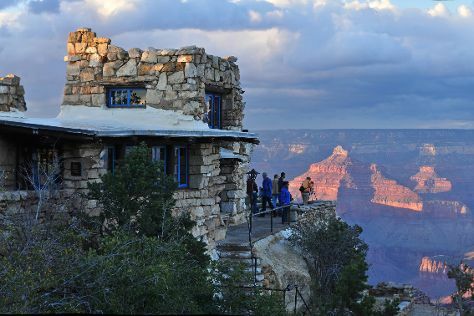 Get ready for a full day of sightseeing on the 10th (Thu): take some stellar pictures from Yaki Point, steep yourself in history at Grand Canyon Railway Depot, get great views at Lookout Studio, then take some stellar pictures from Maricopa Point, and finally get great views at Pima Point. For where to stay, photos, more things to do, and other tourist information, read Grand Canyon National Park travel itinerary planner. You can do a combination of flight and bus from San Francisco to Grand Canyon National Park in 9 hours. Other options are to do a combination of subway, flight, and bus; or drive. The time zone difference moving from Pacific Standard Time to Mountain Standard Time is 1 hour. When traveling from San Francisco in January, plan for slightly colder days and cooler nights in Grand Canyon National Park: temperatures range from 44°F by day to 15°F at night. Finish your sightseeing early on the 10th (Thu) to allow enough time to travel to Key West. Start off your visit on the 11th (Fri): admire the natural beauty at Audubon House & Tropical Gardens, examine the collection at The Ernest Hemingway Home and Museum, look for all kinds of wild species at Key West Butterfly & Nature Conservatory, then take in the architecture and atmosphere at Saint Mary Star of the Sea, and finally explore the different monuments and memorials at Key West Cemetery. To find more things to do, other places to visit, ratings, and tourist information, read Key West trip planner. Traveling by combination of bus and flight from Grand Canyon National Park to Key West takes 13.5 hours. Alternatively, you can do a combination of shuttle and flight; or do a combination of bus, shuttle, and flight. Traveling from Grand Canyon National Park to Key West, you'll lose 2 hours due to the time zone difference. Traveling from Grand Canyon National Park in January, expect Key West to be much warmer, temps between 76°F and 66°F. Wrap up your sightseeing on the 11th (Fri) to allow time to travel back home.